Do you often find yourself on other Instagram accounts jealous of how many subscribers they have? You know, those accounts with 10k, 25k, 100k, and even the beautiful 1M? I’ve been successful getting two accounts to 10k and 28k before I finally said goodbye to Instagram, so I feel I’m qualified to help ya out. Below you’ll find a tutorial video walking you through 7 simple steps to follow to grow your Instagram following and I’ve even linked to an awesome course by Alex Tooby who is an Instagram expert. If you’re also wondering now why I left Instagram after building two accounts successfully, scroll down below the video for the explanation. Thank you for watching today’s tutorial video. I upload training videos every day over on my YouTube Channel – Nick Foy TV so make sure you click the link and go subscribe! 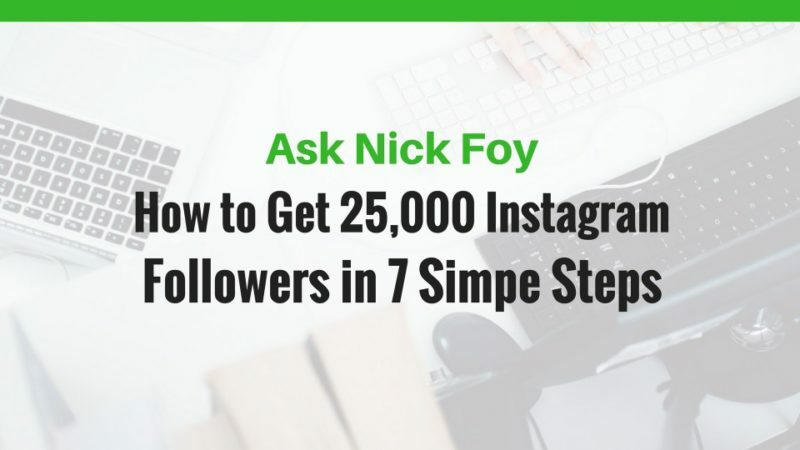 Take Alex Tooby’s Instagram course to sharpen your knowledge of what works to massively grow your Instagram followers and make money from your account. She is the go to expert on Instagram growth tips. To be honest, I haven’t deleted my accounts but I’ve stopped posting regularly. Once in awhile I log in but all of my time is instead focused on building Pinterest. The reason I quit Instagram was because it produced very little website traffic for my blog and that resulted in very few product sales. I was successful at using it to get email subscribers however, but the time trade off made better sense to focus on Pinterest instead to grow quicker. The reason Pinterest beats Instagram for website traffic is that Instagram doesn’t let you link in your posts, only in your profile biography. Pinterest, however, lets you connect every pin you post to a blog article, email landing page, or product page. In fact, most Pinterest users are on the platform to shop! This means better conversion rates for people buying your products. I spent 2.5 years trying to rank on Google and trying to drive traffic from my Instagram account that had nearly 30,000 followers. Yet very little traffic resulted. See this graph. Finally, in February of 2017, I decided to give Pinterest a try. I was blown away by what happened next. In just a few short months my traffic went from 2,000 visitors to over 25,000+ visitors! As you can see, from October 2014 to January 2017 things were going super slow. Trying to drive traffic from Google, Twitter, Instagram, and Facebook was only producing 2,000 monthly visitors. Then I joined Pinterest and started experimenting and BOOM, traffic increased 1,200% in just a few months. If you want to learn how to drive massive amounts of traffic to your website to quickly grow your audience, double your email list size, and make a living online then make sure you check out my course, Profitable Pinterest Traffic. It comes with worksheets, checklists, and lots of training videos to help you set up your Pinterest profile and drive traffic back to a website page or email landing page. Discover the strategies to rank your pins higher in the search feed so they get found by Pinterest users. Save yourself time and money using my system.